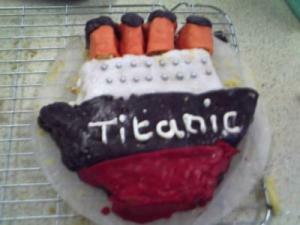 I am looking for a recipe for a titanic cake. 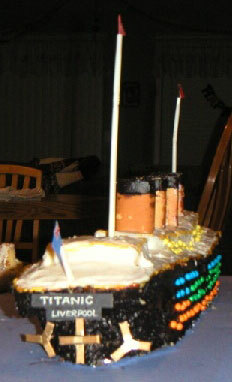 My friend's hubby said he'd like a Titanic cake, so she made a blank dark blue sheet cake with a white iceberg shape sticking out of it - no boat! I wouldnt suggest that for a kid, but it was very clever of her and the hubby liked it. 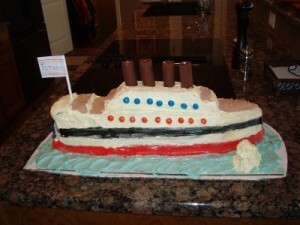 These are pictures and instructions for the cake I made for my son's 11th birthday. I made three rectangle cakes (13x9). 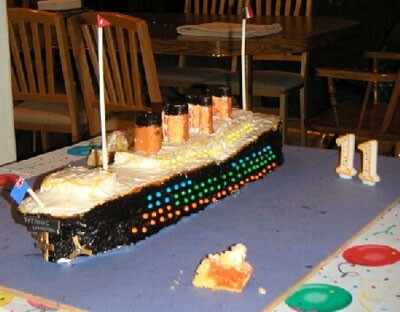 Tip: Don't make moist cakes. constantly and I had to keep plugging in pieces. Lesson learned. Ship labels: popsicle sticks cut with wire cutters to acquire size/length. 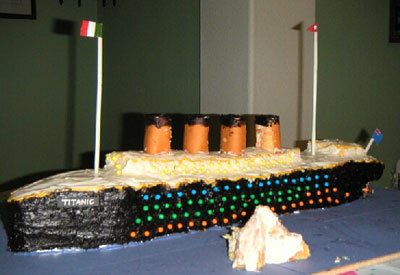 Black construction paper glued on/gold pen for labeling "Titanic"
Be creative use whatever comes to mind. I used a card table with a balloon plastic table cloth. Wipes clean for any messy drops while decorating. I placed the cake on a ply-board used for art. You could simply use cardboard box. I covered it with blue construction paper. Used scotch tape to secure paper to the board. Then took foil and placed it center length wise on the blue paper. The cake sits on the foil. 1st cake: Place cake in a door position. Cut it a little more than half in width. Make your cut straight down. Take a spatula to lift the large piece out and place on foil front. This is placed front for the bow. Set the remaining cake aside. 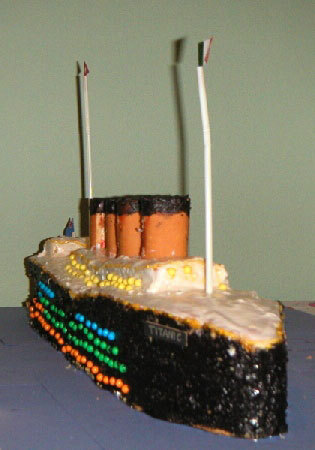 2nd cake: Do the same for the second half for the stern. Place as close together as possible. Of course it won't be perfect. Set remaining cake aside. Place the rolls into the cut-outs. Frosting the cake: Take Black frosting and spray onto a plate for spreading. Use a butter knife or frosting knife and begin applying black first. Then apply black tops to the funnels. Take white frosting and apply to the rest of the cake. Take yellow gel and outline separating black and white colors. As you will see mine ran a little. Portholes: I started at the bottom with orange, then green, blue and finished the top with yellow for first class. Add Titanic labels, propellers, and masts with flags. 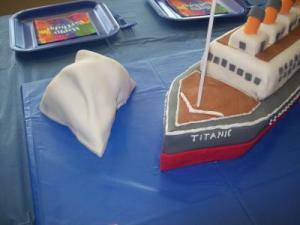 Take remaining cake pieces and lump together for icebergs. I added the #11 to the scene to mark the birthday number. This cake took 2 hrs to bake cakes. 2 1/2 hrs for labels, flags, propellers. To assemble, frost cake and decorations 2 1/2 hrs. This was my first layered creation. I prepared decorations ahead. 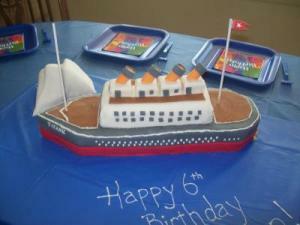 Thanks for some ideas, took some and created one for my son's 7th B-day. Also made a ship out of a box.